In movies, heroes and villains are thrown forward after an explosion. This is because an powerful wave of energy, called a shock wave, is released. In space, the same thing happens when a star explodes in what is called a supernova explosion. The shock wave from the supernova is absorbed by the star's outer shells of gas and dust, which escaped from the star before the explosion. 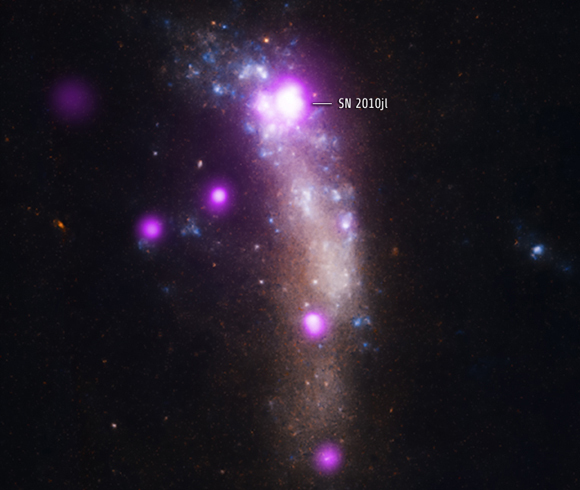 It heats the gas so that it gives off X-ray radiation, which astronomers can photograph using special telescopes in space, like the new picture shown above. Astronomers took two pictures of this glowing cloud of gas and dust, which were taken about a year apart. By comparing the two X-ray photos, astronomers think that the shock wave is finally escaping from the cloud. This is the first time that astronomers have X-ray evidence for a shock wave breaking free from its gassy and dusty cocoon! Cool fact: The shock wave from the supernova explosion heated the gas in this photo to an incredible 100,000,000 degrees Celsius! 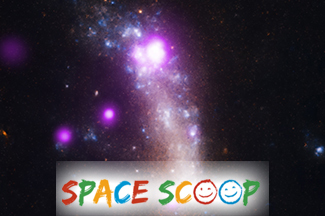 This Space Scoop is based on a NASA Chandra X-ray Observatory Release.